First off, I want to tell you about an exciting giveaway over at A Little Bit of Spain in Iowa. She is giving away a Garden Patch Grow Box. Secretly, I hope I win. I don't feel like digging up my ever-so-small backyard for a garden, so this would be perfect. Check it out! So at our house, we are lucky to have my husband's parents bring us frozen fresh fruit often. In the summer they freeze tons of peaches and apples. We love it. If it doesn't turn into applesauce, or a topping for ice cream, I usually turn it into some crisp or crumble. The other day it was Peach Crisp. I put the servings into my trusty ramekins with the hope that it would get eaten slowly, hence, maybe one a day? Of course I was wrong, I don't even know why I try. I had one, and the rest were devoured by the man in my life in a day in a half. I should have just put it all in one pan. 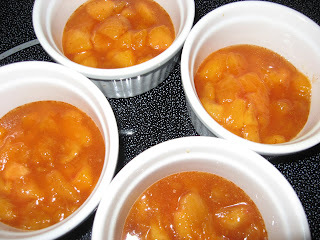 Lay coated peaches in greased 8x8 pan or 4 ramekins. Combine all crumble ingredients and stir in melted butter. Sprinkle crumble on top of peaches. Bake at 350 degrees for 40 min. Do you like fruit in your dessert? I personally am not a huge pan of fruit pies (only apple or strawberry), and the occasional crisp. For some reason mushy fruit turns me OFF. Ally, I am so glad you posted this. I have tons of peaches I froze that I was going to make peach jelly with and never got around to it. Will definitely use this recipe. I love fruit for dessert! I am patiently (or maybe more so impatiently) waiting for strawberries and rhubarb to come into season to make a crisp! BLARF I hate fruit pie, crisps and crunches I can tolerate. I don't like slimy fruit it must be coated with crunchy good stuff. I love the ramekins idea. They look beautiful Ally!! also, i hope you win that contest... i've been voting! where do your in-laws get all the fruit? do they work on a farm or something? that crisp looks delish. the man in my life (my dad) got caught eating pie out of the tin last night : ) something about fruit and crumble topping is irrestible to males apparently! Samantha - I think they order it from the local 4-H kids:) And they always buy a lot at farmer's markets. Damn, that peach crisp looks GOOD. I LOVE warm, baked, gooey peaches. Oh my, my mouth is watering. Ah, I'm so happy for spring and fresh fruits to be in season!!! 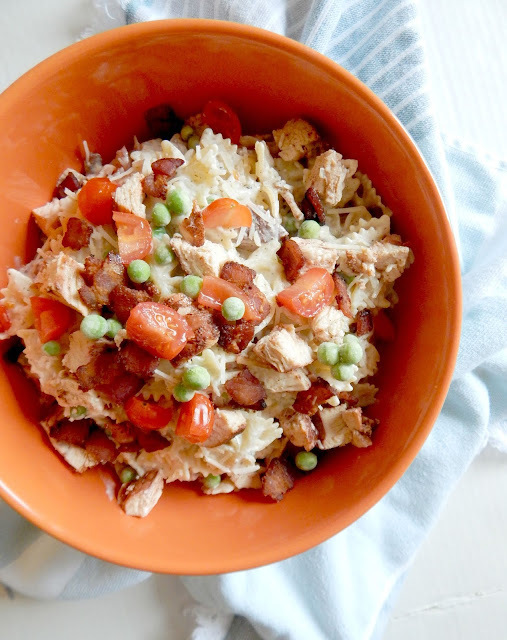 Great lookin' recipe! What a scrumptious peach crisp! These wouldn't last long in my house either! I do like some fruit pie - but not all - cherry is definitely not on the list. I am all about pies, crisps, crumbles, betties, cobblers, you name it. Love my cooked fruit! I didn't blog about St. Paddy's Day either because I didn't cook anything for it. We had our corned beef and cabbage out. Love your fruit crisps. I can't live without my apple pie and blueberry cobbler. You have a great blog here. Ally, lucky you with all the fruit! 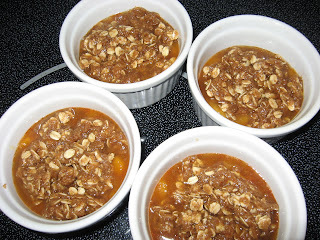 Your peach crisp looks delicious! And I bet they would make great ice cream also. Hope you win the contest, I voted for you. I have a Happiness Award for you over on my blog. Please go over and pick it up, then tell me 10 things that make you happy! Yeast Free Pizza Dough, Award and Winner! Bowl of Noodles....and what is it?